The West African Examinations Council (WAEC) May/June SSCE result is officially out. 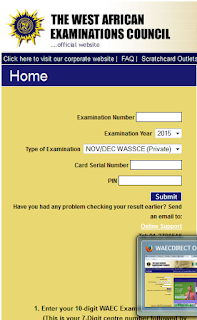 Follow the steps below to check the May-June WAEC result 2015 on WAEC Result Checker website. 3) Select your Examination Year (i.e. 2015). 4) Select the Type of Examination [ i.e. MAY/JUNE WASSCE]. 5) Enter the Card Serial Number found on the reverse side of your WAEC Result Checker Scratch card. 6) Enter the Personal Identification Number (PIN) on your Waec result checker Scratch card (Use the PIN printed on your examination/acknowledgement slip). 7) Click the Submit button and your WAEC result will be displayed on your computer screen. (1) The Waec Result Checker Scratch card may be purchased at the National Office of WAEC and at any of its zonal and branch offices across Nigeria. It may also be bought from any of the branch offices of Banks Plc across Nigeria or reliably get it online from ExpyShop. (2) You may check your results up to a maximum of 5 (five) times with the use of 1 (one) Scratch card. In order to check further after exhausting the allowed 5 (five) times you will need to purchase another Scratch card which will entitle you to another 5 (five) result checks. 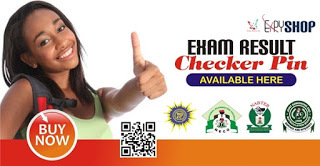 Candidates can now buy WAEC scratch card online at affordable price from Expy Multimedia. Candidates searching for where to purchase PIN and serial number for WAEC result checking can now reliably get it from ExpyShop.